Round about right now there are two types pf people I do not understand (well, in addition to my usual dislikes such as Neo Nazis and people with bad BO, anyway). People who've had enough of asparagus for one year and those, who refuse to touch it in the first place. I don't know how fond of asparagus Asian people are, but the continent has served me inspiration before: just try this asparagus tempura! The inspiration for this came from a recent lunch I had in Stockholm and my. My, my. This just might be my favourite so far. It took me 3 days to drag myself out of the bed and into the kitchen to whip up a batch, but in case you are not hovering between life and death (and the latest season of Orange If The New Black), this dish comes together in mere 5 minutes. Start by making the vinaigrette. Whisk together the ingredients and check for taste. In case you prefer it sweeter, add honey and/or mirin. In case you want a thicker and milder flavour, add more oil. Trim the asparagus (that is, chop off the dry ends) and cut diagonally into 5 cm pieces. In case the asparagus you're using is thick, cut them in half. Heat some oil in a wok (or a frying pan). Add into the pan garlic, chilli and ginger and then asparagus. Cook until done (with still a bit bite to them) - about 5 minutes. 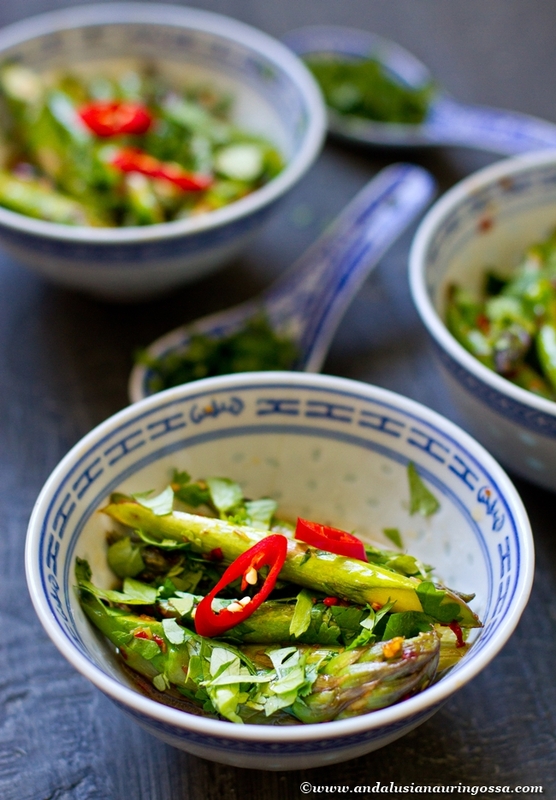 Pour vinaigrette over the asparagus, top with coriander and serve. 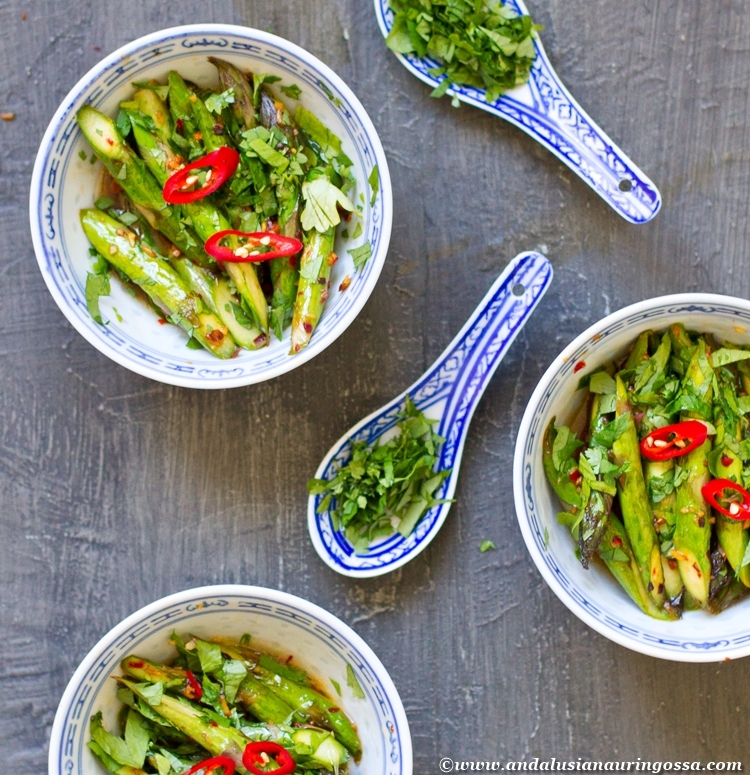 Asparagus and Asian food have (in addition to my greedy stomach!) 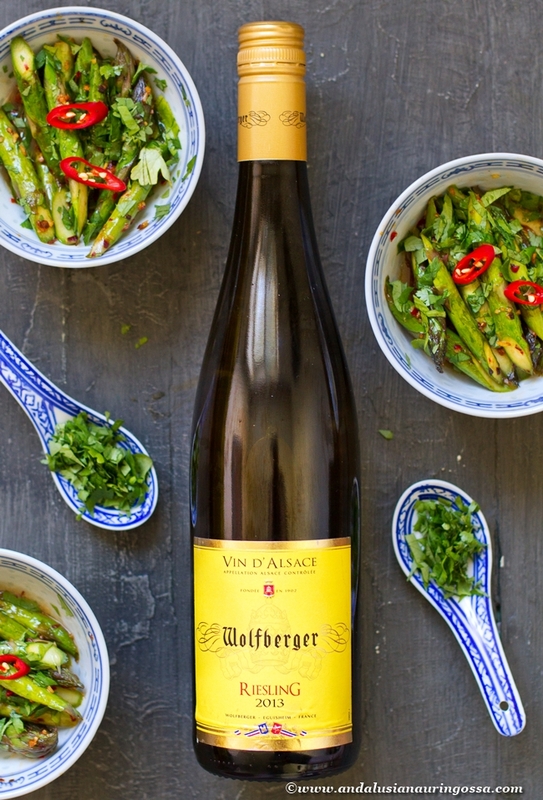 another common denominator, too: Riesling. Since they are both so keen on Riesling and we are both so keen on Riesling, that's the wine we went for. And weren't wrong!